A few weeks ago, I featured a week of breads made with fruits, followed by a week of breads made with vegetables. But during those two weeks, I ran across many foods that can’t be tidily classified as either. The tomato, for example, is a fruit, botanically speaking; but who really uses it as such? What about pumpkin? Because of the seeds on the inside, it caused a gentle ruckus when I announced my intention to use it as a vegetable. Oh, and let’s not even start on the discussion of eggplant, which is technically a berry. So this week, I’m focusing on all those orphan foods that aren’t quite vegetables or fruits, but fall somewhere in between. I’m kicking it all off with one of my favorite non-vegetables, the mushroom. Technically, a mushroom is a “spore-bearing fruiting body of a fungus”*; so does that mean it’s actually a fruit? I think that might be stretching it (what’s the difference between a “fruiting body” and a “fruit”?). I may not know precisely what they are, but I do know that I adore mushrooms. I can’t possibly imagine why people don’t like them, but I know many who don’t. That’s fine; it means more mushrooms for me. One delightful pairing with mushrooms is the sweetness of corn, both of which have a natural affinity for butter. You can find recipes from here to next week that combine these; but oddly, only rarely in a bread format. I’ve seen polenta with mushrooms, corn chowder with mushrooms, cornbread and mushroom stuffing, but not much bread as such. Time to rectify that! The mushrooms are lightly sautéed in butter or olive oil, whichever you prefer, and seasoned with thyme for a little background herbal flavor. You can certainly add a bit of Sherry or cream as they cook, neither of which would be out of place. Bourbon would be another excellent choice, and I was very tempted, but I decided to stay plain with these and see how it turned out. The end result was exactly what I was going for. Or, it would have been, had I remembered to include the salt. Yes, I forgot the salt, and you could really tell. My first bite told me things weren’t right. Oh, the texture was spot-on crunchy and tender, just barely sweet enough, full of mushroom flavor; but yet, it was all somehow flat and dry. My eyes closed in slow-motion as I realized what I had done, and I wondered how I had made such an elementary error. So I did what any cook would’ve done – I picked up the salt shaker. A pinch of salt made things right; the seemingly-dry texture of semolina and cornmeal changed magically into a pleasant and toothsome bite, the dull mushroom turned, Cinderella-style, into a rich, earthy lustre, and I knew I had a winner on my hands. Adding flavorful ingredients to cornbread is a common and wonderful way to add some zing to an otherwise plain bread; and if you like mushrooms at all, I highly recommend trying this recipe. The thyme flavor is subtle here, and I wouldn’t hesitate to add more if you like; feel free to substitute rosemary, mint, or any other favorite herb in its place. Just don’t forget the salt. 1. Adjust oven rack to center position and heat oven to 425 degrees. Grease a 12 cup muffin tin. 2. Heat a large, nonstick pan over high heat. Add 1 tablespoon of butter or olive oil; heat until hot but not smoking. Add enough chopped mushrooms to cover the bottom of the pan, about a third or half of the mushrooms. Toss or stir until coated, and add a pinch of salt. Cook, stirring or tossing, until lightly browned and softened. Remove to a bowl. Repeat with remaining mushrooms. Add thyme, stir, and let sit until slightly cooled. 3. In a large bowl, whisk together cornmeal, flour, semolina, baking powder, baking soda, sugar, and salt. Set aside. 4. Lightly beat eggs, buttermilk, and milk together. Add egg mixture to the dry ingredients, and stir quickly until almost combined. Add mushrooms and melted butter, and stir until ingredients are just combined. 5. Divide batter evenly among greased muffin cups. Bake at 425º F until golden brown and lightly cracked, and edges have pulled away from the sides of the pan, about 20 minutes. 6. Transfer pan to wire rack to cool slightly, about 5 minutes. Remove from tins and serve warm. 1. Muffins can be stored, wrapped in foil, for up to 1 day. If not eating within that time, freeze. 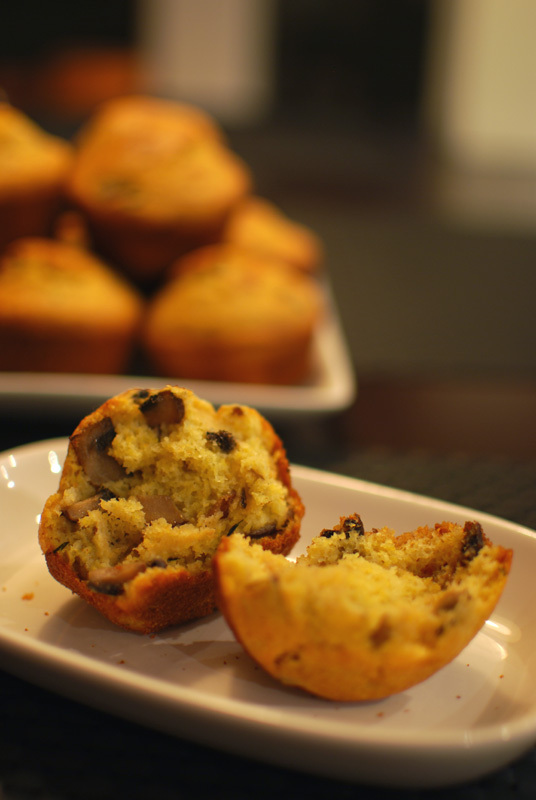 Reheat muffins in a 350º F oven for 5 to 10 minutes, or until heated through. 2. No buttermilk? Warm 2/3 cup of milk in the microwave for 30 seconds, then add a splash of white vinegar. Let it sit for five minutes, then use as directed. 3. The amount of mushrooms used here is variable; use the lesser amount for a more subdued flavor, but use the larger amount for big mushroom flavor. * – Quoted from Wikipedia.